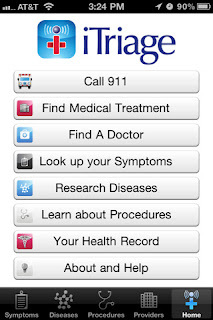 Developer Quote: "iTriage has been used by over 1,000,000 people as a symptom checker, doctor finder, or as a medical reference tool." I've been working in a doctor's office for a while now absorbing all I can about the medical profession. More than anything I have a huge interest in studying patient cases and making my own private diagnoses. Teachers and parents, as well as caretakers for the elderly, will truly make good use of this excellent medical app that offers answers when you need them. 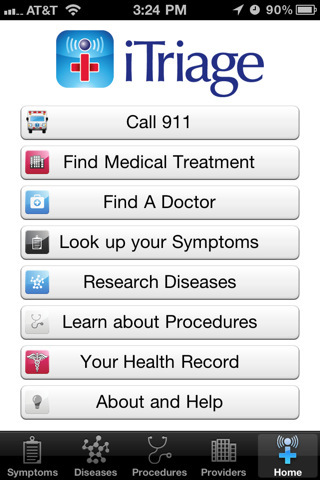 iTriage was especially developed by two emergency room physicians to help people answer troubling questions such as "What might I have?" and "Where could I go for treatment?" - Emergency Room Wait Times and pre-registration for hospitals in select parts of the country. Open the app and choose between several tabs at the bottom of the display such as Symptoms, Diseases, Procedures, Providers and Home. The Home Button gives you many options such as iTriage Symptom Checker, Finding the Right Care, Learn About Procedures, Searching for a Provider, Personal Health Record and more. There are huge lists for Diseases and Symptoms and Procedures which really impressed me. Having the image of the body where you can tap the hurting spot to search for treatment is an ingenious idea also. I believe all this information will be a real lifesaver when carried around on your iPhone or other iDevice. Don't think of going on vacation this summer without iTriage! COOL CONCLUSION: "iTriage has a wealth of information to help you deal immediately with illness and injury, and is a must-have mobile medical app." --iOS/Age Rating: This app requires iOS 3.0 or later. Rated over 17.